LANSING, Mich. — Legislation introduced Thursday would help curtail the rising opioid abuse epidemic in Branch, Hillsdale, and Jackson counties and across the state by educating patients on the dangers of opioids and opioid addiction. Sen. Mike Shirkey sponsored Senate Bill 272, which would require physicians to educate patients and have them sign a form developed by the Michigan Department of Health and Human Services that indicates they understand the dangers of opioids, they have been given proper medication disposal instructions, and they understand it is against Michigan law for their pills to get in the hands of any other individual. Shirkey said that under current practice, many patients neglect unused medication and leave that medication in unsafe places around the house. “This has caused untold harm for people who might not otherwise have become addicted if it weren’t for someone else’s neglect,” Shirkey said. “This is becoming an increasingly serious problem in the 16th Senate District. Individuals in our counties have been showing up in emergency rooms multiple times a week because of opioid overdoses. Other measures in the legislative package include SB 273, sponsored by Sen. Rick Jones, R-Grand Ledge; and SB 274, sponsored by Sen. Marty Knollenberg, R-Troy. SB 273 would require physicians who treat a patient for an opioid-related overdose to provide information to the patient regarding substance use disorder treatments. To reduce the number of unused opioids in medicine cabinets and on the streets, SB 274 would limit the number of opioids a physician could prescribe to less than 100 morphine milligram equivalents per day. All three bills have been referred to the Senate Committee on Health Policy. Note: For a print-quality version of this and other Shirkey photos, click the image or click Photowire, below. 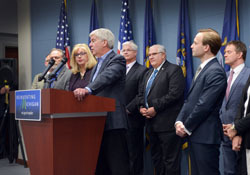 Photo Caption: Sen. Mike Shirkey, R-Clarklake, (fifth from left) listens as Gov. 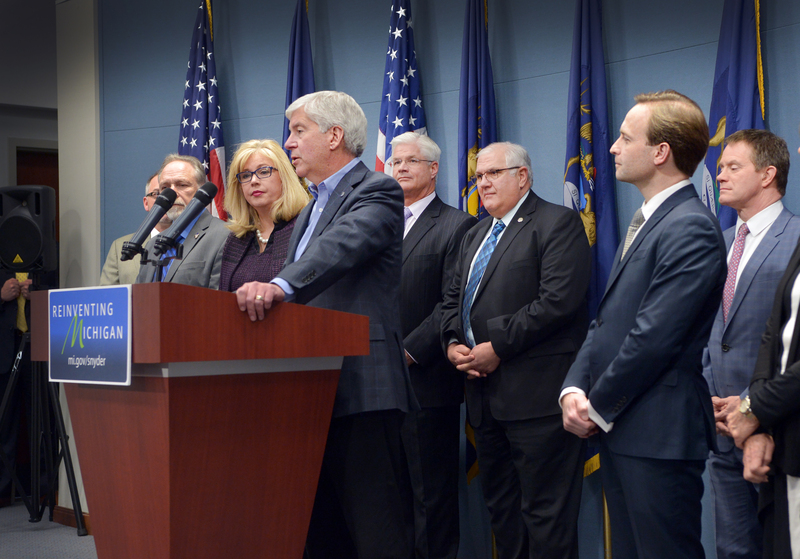 Rick Snyder addresses the media on Thursday regarding a new bipartisan, bicameral legislative package to address the growing opioid abuse epidemic in Michigan. Senate Bill 272, sponsored by Shirkey, is one of the measures in the package.